Try using a mixture of ricotta, yogurt, or cream cheese. In a large bowl, combine pumpkin, ricotta cheese or yogurt or cream cheese, cinnamon and nutmeg. Add sugar a little at a time to reach desired sweetness. Stir until smooth. 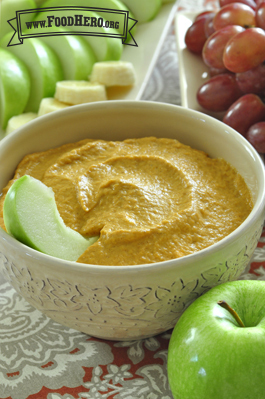 7 Comments for "Pumpkin Fruit Dip"
This is a great recipe for a Halloween celebration instead of serving apples with caramel dip. It definitely does not need 3/4 cup sugar, though. I only added a little bit more than a tablespoon of sugar and used plain yogurt. Serve with sweet ripe apples and pears and avoid all the added sugar! This is an easy recipe to adjust the amount of sugar to meet personal tastes. We suggest adding the sugar slowly and tasting to judge the amount that you like best. This recipe is phenomenal!!! I used plain, non-fat Greek yogurt and left out the sugar. It was fantastic! I dipped apples in it and it was plenty sweet enough with the fruit! Made this for home and for my daughters kinder school class (in place of the school requested caramel dip for a harvest party), its great! So fast, kids loved taste testing different dairy options. Did add much less sugar than the upper 3/4 cup for our families tastes. This is good with ginger snaps too; Yum! I made this recipe with cream cheese, and served it with graham crackers - YUM! Using 3/4 cup sugar definitely made it sweet, so I'd like to try cutting the sugar amount in half next time. I've made this recipe a few times now, and we love it! I have a dairy allergy, so we use Tofutti vegan cream cheese and it tastes wonderful. I also think coconut milk yogurt would work really well, but would add a little more sugar unless you used plain, unsweetened yogurt. I also made this for a couple schools, and over 300 kids apprived of it in one school alone! Very delicious!